I was glad to be of service, but I like being known as ‘that chocolate-guy’ just as much. But frankly, I don’t go out as much as most folks imagine. I love going to my market, talking to the vendors, and coming home with something new that I’ve never tried before, like the chervil roots I bought the other day, which involved a rather detailed, lengthy conversation with the vendor. I mostly cooking all the fine things I find here and learn about. 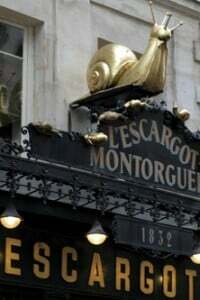 So when I do go out, I want it to be good…no, I want it to be great…and I find the best food in Paris is classic French cuisine; confit de canard, steak frites, and coq au vin. When you find a good version, I don’t think there’s anything more satisfying. Especially if it’s accompanied by good friends. And, of course, a few obligatory glasses of vin rouge. So here’s a round-up of places I’ve eaten lately. There’s a few you might to want to bookmark for your next visit, as well as one or two you might want to avoid. The gorgeous art nouveau interior does little to mitigate the lame meal I had here recently. The chilled Spinach-Avocado Soup was so devoid of flavor, instead lieu eating it, we found ourselves transfixed by discussing whether the spinach itself was frozen, or the entire soup was. When the waiter asked why we didn’t eat it, he wasn’t very pleased with the answer and avoided us the rest of the night. My main course, noix de entrecote, grilled beef, was not bad and served medium-rare, as requested, with industrial fries and a decent green salad. A few sprinkles of salt in the kitchen would have livened things up on just about everything, except maybe the servers. Resting comfortably in the corner of the lovely Square Trousseau is probably the most satisfying restaurant I’ve eaten at lately in Paris. French classics, just right, seems to be their specialty. My lunch engagement began with six expertly-shucked oysters (not one bit of shell in there), which were served simply with a wedge of lemon. Perfect. Afterwards, I moved on to pan-roasted cod with a light butter sauce (which was basically good, French butter, simply melted and drizzled over). Smooth, straightforward service and beaucoup de charme, Le Square Trousseau is one place I’m really looking forward to returning for dinner. I honestly can’t wait. UPDATE: Le Square Trousseau is under new management as of 2009/2010 and I haven’t been back since they’ve taken oven. This place was recommended by a reader, and when I passed the kitchen after entering the restaurant, on the way to “freshen up”, I saw the friendly cooks plating up some very lovely looking food and anticipated a good meal. We all started with rillettes of wild boar, a meaty paste with less-fat than traditional rillettes, the leanness accentuated the flavor of the dark, complex meat. Topped with a flourish of fleur de sel and smoky red bits of pimente d’Espellette, it was a pleasurable accompaniment to our cellar temperature carafe of Brouilly. My main course was lieu jeune, otherwise known as pollack (or cod) on a bed of lentilles de Puy. For dessert, my friend had a slab of muenster cheese, and his daughter and I had coffee (I’m still working off all that gelato from Italy.) Moderately priced, with very friendly service as well. La Boulangerie had appealed to me long before I made it up there. A former bakery turned into a small, neighborhood joint, serving market-based cuisine in an intimate space. What’s not to like? Well, the first thing I didn’t like was when we began with two coupes of nice Champagne. But oddly, they were served in regular wine glasses, not Champagne flutes. Even the humblest of restaurants in France serve Champagne in flutes. But when we asked why, the server told us, “We don’t like wine flutes.” I presumed they were trying to be anti-trendy, but judging from the bobo crowd (ie: trendy), I would have liked my Champagne in a flute. I guess I am bobo. The 28€, 3-course menu looked delicious, so anticipating a nice dinner, I started with the Terrine of Pheasant, and two nice-sized slabs arrived shortly, which were quite good, although served too cold to appreciate the flavor. For my main course, I had a pot au feu of pig cheeks, which came bubbling-hot in a small orange Le Creuset casserole. Pot au feu is basically a boiled meat dinner, which can be bland, so mustard or horseradish are often served alongside, adding a spicy counterpoint. Alas there was none and I assume they where kept where the Champagne flutes are stored. My companion had the côte de biche, chops of deer, which were undersalted and underseasoned. Desserts were the low point of the night, quelle dommage. (Before leaving, I told the waitress I’d be happy to volunteer to work there for one week.) My Cinnamon Cake arrived as a flat disk of plain cake, similarly to what slid out of my sister’s Easy-Bake oven, topped with a few scribbles of sauce and a tasty roasted Bosc pear, which I scraped off and ate. The pain d’epice ice cream was terrific, but the dry, ordinary cake was not easily redeemed. Our other dessert, a Terrine of Clementines with ‘cacao espuma’ (chocolate ‘foam’) came in a glass with a small amount of Clementine gelée hiding at the bottom covered with way too much dark, bitter chocolate mousse, which tasted like melted ice cream and was so rich (and frankly, not very good) and completely obliterated the sprightly charm of the fresh clementines. I wanted to like La Boulangerie very much, but was disappointed. The servers were lively and helpful, and a bit sardonic. The menu read so well, but the food fell flat. Perhaps some of my readers have had better experiences. da rosa also features a terrific selection of items from Spain and Italy, including Amedei chocolates, jams and jellies from Christine Ferber, and fleur de sel. They generously offer samples of their Sauternes-soaked raisins dipped in dark chocolate, which are a fine, after-dinner, or before breakfast (in my case) nibble. This is a great place to come for lunch or in the evening, for a plate of ham, some fine Spanish cheeses, and a glass of wine. Especially if you’re staying in the St. Germaine area. I had a strong dislike of Indian food. Often it’s too brightly-colored, and just seems like a lot of glop. That changed when I went to Thailand, and tasted how wonderful Indian food could be. But since then, I’ve become very picky about where I’ll eat Indian food, and Paris isn’t exactly on the Indian-food map like London is. So when a friend invited me to Dishny, I warily accepted, but was glad that I did. This funky, inexpensive joint is in the La Chapelle area, just behind the Gare du Nord, is a fascinating area where there’s much to explore…although you might prefer to do your exploring during the day, since the neighborhood can get a bit ‘lively’. You’ll find Indian shops selling all sorts of exotic spices, unusual produce, and inexpensive cooking equipment. The Hell’s Angels of Paris headquarters is nearby too. I haven’t been in there yet, but it’s on my list. I always start with naan, a slightly-greasy flatbread filled with warm, melting cheese tucked inside, before I dig into my enormous dosai; a large crepe filled with mildly-seasoned potatoes. Alongside are spicy and cooling coconutty condiments for customization. And the grilled tandoori chicken with basmati rice is good too. Very inexpensive. Maybe you’re one of those visitors coming to Paris who wants to sample lots of the fine cheeses France is famous for. But you’re staying in a little hotel room, not an apartment. Where can you do it? Fromagerie 31 is a cheese shop, but it has several tables and they’ll gladly cut and serve a you degustation of cheeses; five, seven, or nine, accompanied by a green salad with an explanation of each variety. This is a simple, no-frills kind of place but friendly, and there’s a small selection of wines by the glass as well. UPDATE: Fromagerie 31 is now closed. 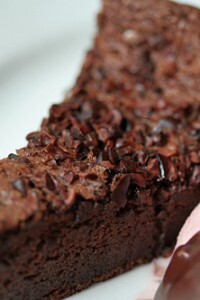 I’ve just added this to my list of Parisian favorites. When a friend came to town looking for honest French bistro fare, he suggested Chez Dumonet, which I’d passed many times but never ventured inside. Fortunately, last weekend I did. Chef John-Christian Dumonet cooks up some of the best French fare in town, riddled with southwestern influences. 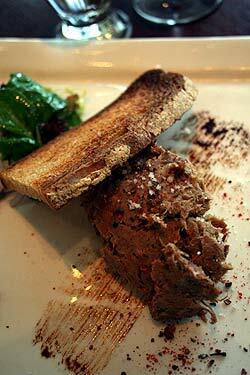 His homemade terrine is meaty and rich with a thick layer of fat sliding off the top. The herring in olive oil with pickled onions is enormous and silkly-smooth, served in an earthenware bowl with lots of onions and potatoes. But what I loved the most was my duck confit; so crisp that I was tempted to eat just the skin and leave the meat behind. But I wanted to save room for the over-the-top Grand Marnier Soufflé, that needs to be ordered in advance. The deceptively-flat puff pastry millefeuille is not to be missed either. It’s as close as one can get to enjoying the pure taste of butter without chewing on a stick of beurre itself. Due to the size of the portions, many dishes are available in half sizes, and the very friendly waiters are happy to split anything. Although I don’t recommend sharing the soufflé. One bite, and you won’t want to share it either! Oh, how ex-home sick you make me. I am drooling. You killed me with the Duck Confit. When we lived there, Le Salon (29 boulevard ARAGO) in the 13th was a good place. 01 45 87 21 86. Métro Gobelins (line 7). 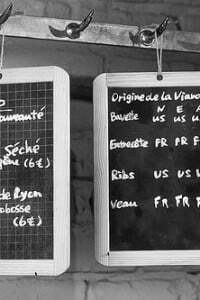 Unusual décor, trendyish but not snobby staff, excellent traditional french cuisine, and a very solid value. Worth a try, and out of they way (it’s on a big boulevard, so not very popular in the evening), so it’s not super crowded, either. Their confit de canard was divine! They beat out the famed L’Avant Goût, in my opinion. I hate eating Indian food at most of the resturants too, even here in the bay area(CA) where there’s a huge Indian population…the simple reason being, as you said, it all looks like a lot of gloop. I think these restaurants just use the same curry gravy for all their dishes. Its VERY difficult to find authentic home-style Indian food anywhere (this is coming from an Indian, in case you’re wondering). Ronica: Thanks for the suggestion. I’ve learned to take my reader’s advice! Nabeela: After writing this entry I went to Dishny last night! I don’t know Indian food all that well, and I’m waiting for someone to show me around the Indian shops here in Paris, in La Chapelle. But I love poking through them. What happened in Thailand that made you rethink Indian food? Did you not like Thai curry? Do you know how many times you mentioned some form of fat in that post? Hahaha! And you so skinny. A dangerous man. I have, I love Fleur de Sel Gris. How can I best serve it at table for my Umbrian friends who like everything but the bread salty? We can’t use shakers here, anyway, because it is too humid no matter what you put in there with the salt, so salt is served in a dish with a teensy spoon. So I presume something similar, but what’s normal? i ordered a iberico lomo from the first shipment to us and it is soo good! can’t wait to try the jamon iberico at dona rosa. David, I love reading your comments and but after tidying up my ‘Favourites’ I deleted your site. So after trying in vain to remember your name I typed in ‘Chocolate Expert Paris’ and your site was the first on the page. Not only are your that ‘Chocolate guy’ but ‘the Chocolate Expert’. Blush. I think that “reader” could be me relative to Les Fils de la Ferme! Glad you liked it. We have stayed several times right near Fromagerie 31 and we loved that fromagerie. Small and not as well-known as some of the other cheese shops. But, great nonetheless – often we would go to La Derniere Goutte and grab (ok, buy) a nice bottle of wine to go with whatever cheese we chose at Fromagerie 31 and bring it back to our hotel room. A little late in the game, but I have to weigh in on the Indian restaurants in Paris. If you ever have the urge to try another one, I recommend Arti, 173, r. Lecourbe, 15e. It’s a complete hole in the wall, very inexpensive, but I have yet to have better Indian food, even in London. Their Buryanis are out of this world, full of super fresh whole spices, their naan is the best, and for me (super glutonne) I love the butter chicken. Open every day. 01.48.28.66.68. If you live near enough, as we did, they even deliver. French food is wonderful, don’t get me wrong. But too many French restaurants in Paris have become complacent recently, especially to tourist. Alot of tourist come from non-food cities, go to a French restaurant and think it’s French it must be good, when in actuality it was awful. Some of the worst meals I’ve had in Paris were French restaurants, ala “Metro.” The “Metro” is a Costco for Chefs and any licensed business. Lots of the food is “par” cooked, and all the restaurants have to do is warm it up or crisp it up, e.g., confit de canard. And, in some cases defrosted, in the case of desserts! Because the tourist probably won’t be coming back, these restaurants, especially in the 5eme (Latin quarter), could give a damn. What I’ve discovered about Paris is all the wonderful ethnic restaurants. I have found some of the most incredible restaurants at hole-in-the wall places in the 9, 11, 12, and 18 (non tourist sections) arrondisments. They are Ethiopian, Senegalese, Middle easterns etc. I recommend you explore and go down the beaten path and you will discover some of the most exciting food experiences. Granted, not all of them are going to be fancy white table cloth and linen restaurants, those have their places. And, some places may seem “colorful” , but Paris is actually a very safe city. I confess I am a food snob, because I grew up with good food, went to Culinary school and my father was a Pastry Chef, and brought me up to believe that good food can be found. P.S. I live in Paris part-time. Dishny used to be one of my perennial stops in the Indian quarter around Gare du Nord, mainly for takeaway. The restaurant itself, I quickly learned, is a hangout for Indian friends of the owner. Nothing wrong with that, but after work I used to take out bags of Indian food for the next couple nights’ dinners. Ask, and they will throw in some interesting green sauce. Only problem is that it took a good 20 minutes for preparation. Now, on my Indian pickle and curry leaves run in the neighborhood, I’ll stop at Ponchiderry and take home a bagful of the tandoori chicken pieces and onion barami. No matter what you order there, it’s quick and it is 12 euros. You can order 20 items, 12 euros, or you can order 2 items, 12 euros. Opt for 20. By the way, never look into the kitchens of these places. Don’t ask why, just don’t look. We are in Paris for a few days and last night, longing for some classic French Bistro fare, we made a reservation and headed to Chez Dumonet. We didn’t stay long. We were greeted at the front of the restaurant by Monsiuer Chef John-Christian Dumonet himself (although we didn’t know it until later). The waiter asked the chef which table were were to be given and although I didn’t catch the exact exchange, but the waiter certainly seemed surprised by the response. We were then taken through the mostly empty restaurant to a table in a tiny area at the very back, right by the kitchen. None of the four tables in this section had been set (every other table in the house had been). The tables were quickly set and my wife asked (en francais) is it normal to be seated here? The waiter was evasive. She asked a second time and this waiter too seemed embarrassed and evasive. At this point we made up our minds to leave and cut short the insult. In fact we left so quickly my wife forgot her purse. On returning to fetch it, a young waiter had run to find us, and urged us to return saying they would do ANYTHING we wanted. But we were not in the mood to be reminded of the initial insult by remaining (at this point we discovered our seat had been determined by the Chef himself). It did seem that both the waiter and the maitre’d were genuinely dismayed by the chef’s treatment of us. But if Chef could not give us the benefit of the doubt, we could not give him that courtesy either. If you are a tourist, and if your french is not impeccable, you risk insult. Maybe if we had arrived when Chef was busy in the kitchen, we would have been spared this unacceptable behaviour. On our walk back to our hotel we stopped at La Mediterranee where even without a reservation, and although the restaurant was full and very busy, we were received with grace, seated at a lovely table, and served a meal of impeccably cooked and creatively prepared seafood with a nice Pouilly Fume and delicious desserts. We are experienced diners, our french is pas mal, we are polite, presentable and affable, and we have never experienced this kind of rudeness in France on any of our 7 visits over the last 15 years. 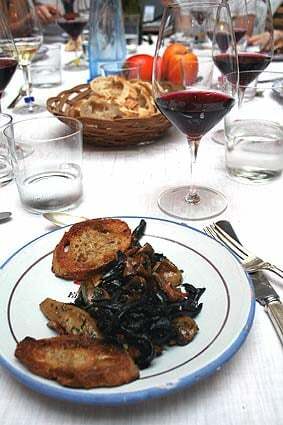 We just came home from a weeklong sojourn in Paris, and one of our fondest memories is of the food at Chez Dumonet. We arrived early since we did not make any reservations, and yes, we were seated in the back (along with two other American couples and two French businessmen). The food was wonderful–my duck confit was excellent, as was my husband’s boeuf Bourguignon. But wow, there was just too much food. We could barely finish the Grand Marnier souffle, which we ordered before we knew how much food we’d be getting. Luckily, we saved Chez Dumonet for our last meal in Paris, after we’d eaten some awful meals at other places (where the duck and beef were so tough we could not cut through them). This place was a great recommendation, so thank you for it! I am a huge fan of David, and his recommendations are usually spot-on. However, we just came from a dinner for 4 at Dishny, and mediocre is about the nicest word I can think of. The starters were greasy samosas, soggy onion bhaji, and those fermented lentil fritters (forget the name) were heavier and denser than a bad NY knish. Main courses were tasteless, even simple yogurt lassys were too thick, and we couldn’t tell the salty one from the sweet. Maybe the place has changed hands since it was first reviewed? Hi Heidi: Thanks for your feedback. This post is dated 2006 and because of the volume of posts on the site, I’m unable to go back and update as much as I like. So I do appreciate when readers leave comments, such as yours, offering advice and opinions as well. Merci! We just spent a couple of days in Paris, and my wife had done her homework. As in, she looked at food and restaurant recommendations. She likes your blog, so she printed out some of your recommendations and brought them along. Every day, we went to one of the restaurants you suggested. L’As du Falafel, Chez Dumonez, Lapérouse and Cuisine de Bar. We loved them all. The duck confit at Dumonez was marvelous, the diner at Lapérouse was exceptional, Cusine de Bar was fun, and the falafel won in direct comparison to the place directly across the street (who offered falafel for tasting). The staff at each of these places was friendly and fun. We liked them all very much. Your suggestions didn’t steer us wrong even once, and we’ll certainly follow some more of them the next time we go to Paris.